Growth Mindset Books for Kids are All the Rage Right Now! Are you looking for growth mindset books for kids? We have an amazing list of books here for you, compiled because we know how important children’s books about growth mindset are to the healthy development and well being of our kiddos, no matter their age. Why are there so many children’s books about growth mindset these days? You’ve probably heard the term “growth mindset” a lot lately, especially if you work with children. And for pretty good reason. The growth mindset phenomenon has taken the educational world by storm! Researched significantly by psychologist Carol Dweck, growth mindset refers to the idea that a student believing he can get smarter is more likely to understand that effort and hard work will strengthen his academic performance. It’s the notion that a person’s intelligence can be developed, and a student that is applauded more for her effort rather than their her intelligence will perform better in future projects. Kids with growth mindsets are more likely to take risks, tackle challenges, and learn from their mistakes. So what does this mean? To me, this means our kids need to have setbacks. They need to fail sometimes. It is so important for kids to understand that everyone makes mistakes, that they can learn and grow significantly from such mistakes, and that their effort is EVERYTHING! Needless to Say, Growth Mindset Books for Kids are Flourishing! Authors and illustrators have run with the growth mindset concept. Some incredible children’s books about growth mindset have been published in recent years, books that truly embody the notions that effort and courage are the most important characteristics our children can embody- not just in the classroom, but in connection with hobbies, relationships and even fears, too. It is not difficult to understand why. children’s books about growth mindset help kids recognize there is so much opportunity to be found within every apparent obstacle and set back they face. If kids understand the significance of rising to a challenge, no matter how overwhelming, difficult or scary it may seem, we’ll come a long way towards nurturing confident and resilient kids. Children who understand they are entirely capable of growing and evolving are those who will recognize the beauty in perseverance. They will also be the first to recognize that failure is not something to frown upon but instead a free ticket to try again -- this time, even harder. It takes courage to keep on keeping on, but the results are incredibly rewarding. So what are you waiting for? Let’s get our kiddos thriving with these outstanding growth mindset books for kids, stories that exemplify the notions of perseverance, grit, and sheer determination to overcome all obstacles and challenges! After the Fall, by Dan Santat: This is the story of what happens after Humpty Dumpty gets put back together and how he manages to overcome his newfound (and crippling) fear of heights. The themes embraced here -- anxiety, resilience, and putting oneself back together after a fall -- lend themselves well to didacticism, but Santat delivers this story with the the lightest touch, enabling it to speak to children at all social and emotional maturity levels. A masterpiece! For our full review of After the Fall, click here! What Do You Do With a Chance, by Kobi Yamada and illustrated by Mae Besom: Here, a young child is confronted with a chance out of the blue. But the boy doesn't embrace it; he is uncertain and pulls away. When the next chance comes around, he reaches for it and falls. He is overcome with fear, never wanting to feel so foolish again. The chances keep appearing, though, but because he keeps ignoring them, they eventually cease. Only then, of course, does the boy realize that as scared as he is, he does want to take a chance. Will he be brave enough to seize a new opportunity? For our full review of What Do you Do With a Chance, click here! The Dot, by Peter H. Reynolds: Vashti can’t draw, and because she knows she’s no artist, she doesn’t even want to try. To prove her point? She makes an angry dot on her piece of paper. Vasthi’s teacher makes her sign her dot drawing, and thus begins the start of a beautiful journey. We adore the way this book encourages play and experimentation as an antidote to failure. For our full review of The Dot, click here! How to Catch a Star, by Oliver Jeffers: There once was a boy who loved stars so much, he wanted to catch one of his very own. He tries everything to grab one, from waiting for the stars to tire and fall from the sky, to climbing the tallest tree. Nothing works, though, and right as he is about to give up, the boy discovers that some things aren’t quite what we expect them to be! The Wall in the Middle of The Book, by Jon Agee: In this powerful story, there is literally just what the title says - a wall running along the gutter of the book. On one side of the wall stands a knight who proudly proclaims he is safe. The dangers, after all, live on the other side of the wall. So what exactly is on that other side? Angry animals and evil ogres, of course. Yet when the knight finds himself in need of serious help on his side of the wall, the dangerous side may become his safe haven if only he can get there -- and change his perspective. For our full review of The Wall in the Middle of the Book, click here! Drum Dream Girl, by Margarita Engle and illustrated by Rafael Lopez: This is a beautiful story of a young girl living in Cuba who so desperately wants to make music. It is the epitome of turning a "can't" into a "you better believe I can"! Who says girls can't play drums? We love the protagonist's no holds barred attitude and her determination to turn her dream into a reality. Aside from the fabulous narrative, the illustrations are simply breathtaking. The Book of Mistakes, by Corinna Luyken: Many kids are perfectionists, beginning a project again and again because they cannot start it off just right. How do we nurture their creativity and limit their insecurity? Use this book to show little ones that magnificence can be found in mistakes, even our biggest ones. An "oh no" can easily become an "oh wow!" with just a bit of endurance and a whole lot of imagination. Kids will be amazed at the manner in which Luyken's smudges and spills are transformed into something extraordinarily special. For our full review of The Book of Mistakes, click here! 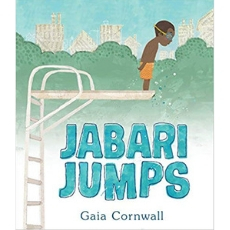 Jabari Jumps, by Gaia Cornwall: Jabari is quite excited to jump off the diving board at the city pool – if, of course, he can first conquer his fear of heights. This book is true to life and, in short, exudes compassion and tenderness in the best way possible. It is a touching story of how a boy's trust in his father, coupled with his dad’s gentle encouragement, help one small child jump off one big board. For our full review of Jabari Jumps, click here! Ursa’s Light, by Deborah Marcero: How we love the story of Ursa, a bear who dreams big-- and then even bigger! Ursa wants to fly, but her initial attempts at soaring all fail. Bears, after all, don't fly! But when Ursa auditions for a role in a show as a shooting star, her performance might just allow her dreams to take flight. We love this story and its message of always believing in yourself, even when others might try to steer you in a different direction. Max and Marla, by Alexandra Boiger: A boy and his owl are on a mission to become the next winter Olympic sledding champions! They understand the rules of the game and have taken all the preparations they need to succeed. But when they take some unexpected tumbles, they learn that true success might not always be measured by a medal at the end of the contest. We love this sweet and engaging story of practice, perseverance, and, above all, friendship. For our full review of Max and Marla, click here! Accident!, by Andrea Tsurumi: Accidents happen to the best of us, and how we handle them says a lot. Are we going to fess up, clean up, apologize, and move on? Or are going to run away from the problem? This fabulous book handles the notion of “accidents happen” in a brilliant way, with animals running far from their catastrophes only to encounter more problems. Only when a wise little bird whispers the word “accident” do the animals realize how they can make things better! To check out some books that teach responsibility to kids, click here! Saturday is Swimming Day, by Hyewon Yum: If your kids are hesitant to jump into the water, this story is a must. One little girl happens to get a stomach ache every Saturday before her swim lessons. With the help, patience and kindness of a wonderful teacher, the child finds her confidence and realizes she can’t knock something if she doesn’t even try it! Ruby’s Wish, by Shirin Yum Bridges and illustrated by Sophie Blackall: Most little girls in China dream of growing up and getting married, but not Ruby. Ruby wants to go to school, and despite all the people who try to persuade her that girls don’t do such a thing, she persists. This is a beautiful story of a girl who strives for an education just like the boys in her family. The Darkest Dark, by Chris Hadfield and illustrated by the Fan Brothers: Inspired and written by a real life astronaut, this is the story of a child who is scared of the dark. Yet, when he sees the Apollo 11 landing on television, the boy realizes that space is the darkest dark there is. If he truly wants to be an astronaut, he has to open his eyes to the wonders of the deep, dark sky -- even if it’s awfully scary and intimidating at first. Rosie Revere, Engineer, by Andrea Beaty and illustrated by David Roberts: Quiet by day, brilliant inventor by night, little Rosie dreams of becoming a great engineer. When her aunt (based on the great Rosie the Riveter) comes for a visit and mentions a dream of flying, Rosie sets out to make her aunt's dream a reality. Though she hits some roadblocks, Rosie never gives up. As the book so brilliantly explains, you can only truly fail if you quit. For our full review of Rosie Revere, Engineer, click here! Bike on Bear, by Cynthea Liu, illustrated by Kristyna Litten: Bear can do many things well-- except for the one thing he desires most of all: he cannot ride a bike. He stops at nothing to learn this skill and eventually finds a "how-to" book which he devours. Nothing seems to help though, and when a young goat suddenly gets carried away by the wind, Bear knows there is only one way to save the baby animal - by jumping on his bike. Will he succeed? Adrian Simcox Does Not Have a Horse, by Marcy Campbell and illustrated by Corinna Luyken: Adrian Simcox tells his classmates he has a horse - the best and most beautiful horse in all the world. But Chloe knows Adrian is lying. After all, Adrian Simcox lives in a tiny house and has holes in his shoes, so there’s no way he has a horse in his backyard. The more Adrian talks about this beautiful horse, the angrier Chloe gets... and the more she wants to prove him wrong. Will vindication give Chloe the satisfaction she so desires? Or will she gain a new understanding -- and compassion for her classmate? For our full review of Adrian Simcox Does Not Have a Horse, click here! Hana Hashimoto, Sixth Violin, by Chieri Uegaki and illustrated by Qin Leng: Hana signs up to play the violin in her school’s talent show, but there’s one tiny problem - she has only taken three lessons! Though her brothers insist she isn’t good enough, Hana practices every day and strives to play the violin as wonderfully as her grandfather. Hana is nervous before the show, though, and her confidence is shaken. But, when she begins to play, she realizes she is not just surprising her audience, but herself, too. Nerdy Birdy Tweets, by Aaron Reynolds and illustrated by Matt Davies: How do we go from being addicted to social media and impulsive behaviors with our gadgets to taking a look up? How do we make sure we don’t hurt anyone with things we post online? These are just some of the questions sparked by this fabulous book about how we grow to become responsible internet users. Many of us need to adopt a growth mindset when it comes to technology, too! I fell in love with this story instantly and believe it should be required reading for students of all ages -- especially those in upper elementary school who are just beginning to navigate the online world. For our full review of Nerdy Birdy Tweets, click here! The Bad Seed, by Jory John and illustrated by Pete Oswald: Look out, folks, because the Bad Seed is in town, and he is baaaaaaaad to the bone. He’s got bad manners, a bad temper, and a majorly bad attitude. He’s been bad for as long as he can remember. But you know what? He’s got an awful lot of power in his hands - power to change himself for the better. We love this one, and its a new fantastic children’s book about growth mindset for your collections! Beautiful Oops, by Barney Saltzberg: This book is an absolute gem that shows children (and adults!) that with a bit of creativity, our mistakes can be turned into discoveries. Maybe tears in paper, ink spills and drawing mishaps exist simply to make magic happen. This book, with its pop-ups and flaps and holes and tears, certainly makes it seem so. One of our forever favorite growth mindset books for kids! The Little Engine that Could, by Watty Piper: The famous phrase, "I think I can, I think I can," originated from this brilliant book. What a perfect mantra to instill in every child, every person, no matter their age. This classic children's story, first published in 1930, is timeless for a reason. It's a perfect growth mindset book for kids for the way it reminds children that they can do anything and everything they put their minds to, no matter how big the obstacle in front of them may seem. For our full review of The Little Engine That Could, click here! Emmanuel’s Dream: The True Story of Emmanuel Ofosu Yeboah, by Laurie Ann Thompson and illustrated by Sean Qualls: This stunner of a book blows my students’ minds every time I read it in our library. Born in Ghana, Emmanuel had a deformed leg and was dismissed by many, including his own father. But his compassionate mother told him he could do anything he wanted, including hopping on one leg to school two miles each day, playing soccer, and riding a bike. in 2001, Emmanuel rode his bike 400 miles across Africa, spreading the message to all who could hear and see that “disability is not inability.” Powerful and oh-so-inspiring, this book is a treasure. Flight School, by Lita Judge: Poor Little Penguin just wants to fly. Yet, even with the self-proclaimed “Soul of an Eagle,” his body simply wasn’t made for flying. Despite this simple fact, Little Penguin won’t be deterred. Instead, he attends flight school, where his first few attempts at flying end up with major flops instead of flaps. Though he is heartbroken, he doesn’t give up, and with the help of his teacher, Little Penguin does soar — even if just for a short snippet of time. An adorable children’s book about growth mindset! DID YOU LIKE THESE GROWTH MINDSET BOOKS FOR KIDS? WE THINK YOU WILL LOVE THESE POSTS TOO! Our Must Have, Go-To Children’s Books About Courage! Are you following us on social media? Make sure to check us out on Instagram, Twitter and Facebook! And don’t forget to sign up for our newsletter, here!